A wildfire burning in northern Arizona since Tuesday has scorched some 4,500 acres and sent thousands of people fleeing ahead of the flames’ path. 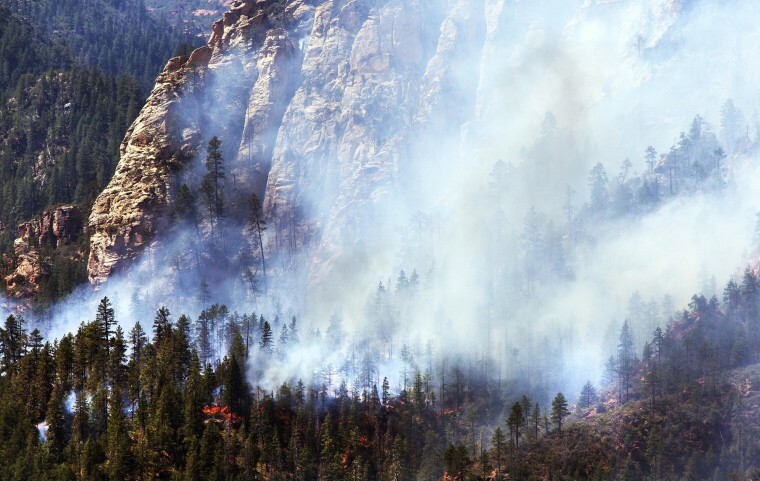 Hotshot fire crews are streaming into Oak Creek Canyon to fight the blaze, which was still at zero containment late Wednesday. “Everything’s kind of going against us,” said fire official Bob Orrill. Read more in NEWS. Chinese officials are calling the deadly explosions today in the western region of Xinjiang a “violent attack,” stopping short of labeling it as terrorism. More than 90 others were injured in the blasts, which occurred when explosives were flung from two SUVs, witnesses said on social media. Officials vowed to find those responsible. Read more in NEWS. Thailand’s army chief announced the military is taking control from rival political factions in order to keep the country from slipping into a civil war. The army first declared martial law Tuesday after street protests have left the country without a proper government. This would appear to be the first coup since 2006, when the country endured military rule for more than a year, although the army has been careful not to call it a "coup." Read more in NEWS. A whistleblower told NBC News that staff at Raymond G. Murphy Medical Center was ordered to enter false information into veterans’ charts in order to improve performance measures. In a complaint filed to the Office of the Inspector General, the whistleblower also alleged that “the pressure to falsify information had come from management,” and described VA Albuquerque as having “a climate of deceit.” The House, meanwhile, passed legislation Wednesday that would give the VA secretary more authority to remove or demote senior executives in connection to the growing VA scandal. Read more in INVESTIGATIONS. At least 11 dead bodies were seen at a checkpoint in the eastern Donetsk region, according to Associated Press journalists. Witnesses told them that about 30 Ukrainian troops were wounded by pro-Russian insurgents, marking more violence in a region rocked by separatist fighting. Read more in NEWS. Obama, a big baseball fan, will be the first sitting president to attend the popular destination in Cooperstown, New York. He’ll be promoting tourism and announcing measures that would reduce airport wait times for international travelers who want to come to the United States. Read more at NBC SPORTS. The King of Pop would be pleased. A student at Pitman High School in Turlock, California, moonwalked across the gymnasium floor in a taped routine to Michael Jackson’s “Billie Jean.” His dedicated dance and lip-sync won Pitman’s talent show this year.